The CARA meeting on Thursday 17th October 2013 featured three short talks by club members. Iain, M0PCB, described ClubLog – a website for analysing your log. Nick, G4WLC, talked about “Excursions with Elsie” – Elsie being a van he has equipped for use as a portable shack. Simon G6AHX related his experiences working through satellites. Chairman Doug G4IGN talked about the new club project: a computer-radio interface unit for data-modes built from a kit. Several members expressed interest in buying and building the kit. The antenna analyser built from a kit earlier in the year was also on display at the meeting. Some 15 people attended the CARA Summer Garden Party on Sunday 25th August kindly hosted by Rosemary and Ken G3XSJ at their delightful QTH near Wotton-under-Edge. The gathering was blessed by warm and sunny weather and plenty of excellent food. So a good time was had by all. Our grateful thanks go to Rosemary and Ken for their generous hospitality. 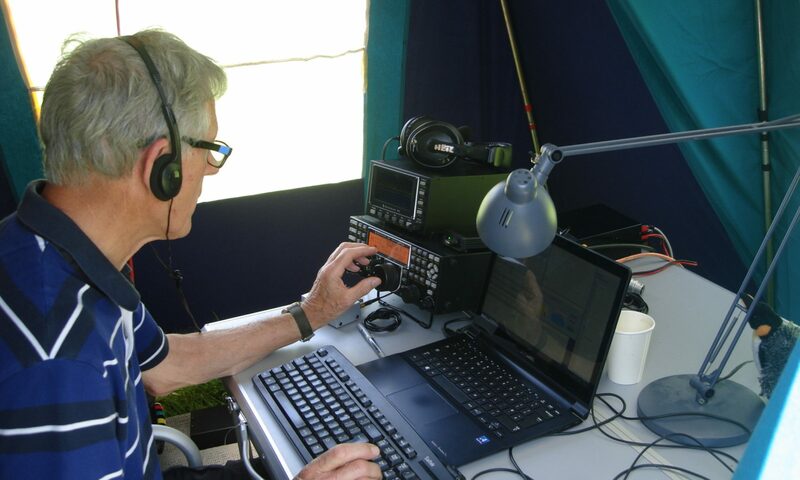 The results of HF CW National Field Day in June are now available on the RSGB website. For various reasons G5BK/P was active for just a few day-time hours on the Sunday instead of the planned 24 hour period of the contest. The revised plan had been to enter the Low Power Section (5W, 12 hours max) but a misunderstanding of the antenna rules (by G3NKS!) meant that the entry had to go in the Restricted Section (100W and 24 hours). Not unexpectedly G5BK/P came 20th out of 20. Had the entry been eligible for the Low Power section the result would have been much better: 6th out of 10, not bad for just 7 hours of operation out of the 12 allowed and with no operation on 160m where there was a “times-two” points bonus for each QSO. However the exercise proved that QRP operation was fun and could produce good results, something to remember when future CARA entries in this annual event are being considered. The operators were G3NKS and G4ENA. The rig was an Elecraft KX3 and the antennas were dipoles for 40m and 20m on a common feeder. See photos elsewhere on this website. The final results of the RSGB 80m Club Championship 2013 are now available. For those not familiar with this annual competition, here’s a brief outline. Every month from February through to July there are three short 80m contests held during weekday evenings, one each on SSB, CW and data (PSK and RTTY), the days on which the contests take place vary from month to month (and often clash with CARA meetings). Clubs can field as many stations as they can muster. There are two categories: Local: where members taking part normally reside within 35km of the club’s meeting place, and General for clubs with a regional or national membership. CARA enters the Local Club category and this year we achieved 8th position out of a total of 37 clubs in that category. This is a very pleasing result considering that we did not participate in three of the 18 sessions and that several of our higher scoring members missed other sessions too (often because of a clash with our meetings). Six CARA members contributed to the total score of 15,323 points: Martin G4ENZ (4,382 points), Derek G3NKS (3,914), Peter G4ENA (2,912), Gordon G3MZV (2,645), Ian M0ITF (1,286), Don G3ZKN (184). The meeting on Thursday 15th August was really great, very well attended, with superb data-modes demos and displays. Colin G3VTS had his TenTec Jupiter receiving 20m data signals with the aid of a small magnetic loop constructed for the occasion. Stuart M0GPC showed a range of early packet radio controllers. Paul M0UTC demonstrated various data-modes from his car. Jon M0JMM displayed his portable hf and vhf data-modes station and exchanged DRM pictures with Paul on 2m. As a side show, Derek G3NKS had a couple of tables selling “Silent Key” stuff. Great interest was shown in all the displays and much chat took place; it was clearly a very popular meeting – there were 39 names in the attendance book. We were please to welcome visitors Mike M0JVP and Arron 2E0CUX. Many thanks to all who brought along equipment and to Andy M0JLY for manning the refreshments bar. As usual, our August meeting is a Natter Night with a theme. This year members are invited to bring along equipment relating to data-comms modes to put on tables for display and for demonstration if so desired. We look forward to seeing, among other things, computer-radio interface units and laptops running data-modes programmes. Paul M0UTC has kindly agreed to bring along his mobile set-up and demonstrate PSK31 and may be DRM (digital pictures) – regarding the latter, he asks if another member could set-up a DRM station in the building so that pictures could be exchanged between the two of them. Any offers please? Come along and chat to other club members, introduce yourself to our newer members and enjoy the displays and demonstrations. Tea, coffee and biscuits will be available as usual. The meeting will take place on Thursday 15th August, 7.30 for 8pm at the Brizen Young People’s Centre, Up Hatherley Way, between Morrison’s and the Shurdington Road, Visitors and prospective members will be made welcome, as always. The RSGB’s annual Commonwealth Contest takes place every March on CW the main HF bands. This year, as usual, several CARA members took part, with the following results. Apologies to Martin G4ENZ who should have been included in the team, but was inadvertently omitted. With his score included, we would have been much higher up the table. The Wythall Radio Club, B47 6LX, south west of Birmingham, will be running an Advanced Course for 14 weeks commencing Monday 2nd September. Classes will be in the shack on Mondays from 8pm – 10pm. There are a couple of Saturday mornings, week 7 for test equipment measurements and week 13 for revision. The exam will be on Friday Dec 6th at 7pm. The cost of the course will be £60 which includes course book, course materials, exam fees and admin costs. The results of the very popular CQ Magazine’s World Wide DX CW Contest held in November 2012 were published in the May 2013 edition of the magazine and are also available on the CQ Magazine website. Contests may not appeal to all, but they certainly produce activity which otherwise is often, unfortunately, at a low ebb these days. The old saying “Use it or Lose it” still applies so in my view contests, DXpeditions, special event stations etc are a very good way to promote much needed activity and band usage. The 48 hour CW contest produced 7,227 entries from across the world, with 218 DXCC entities being worked. 6th: M0VSQ (op M0PCB) 575,082 points,1349 QSOs. 8th: G4SGI 420,072 points, 842 QSOs. 7th: G3NKS 323,890 points, 754 QSOs. 15th: M0NQN 21,420 points, 104 QSOs. 17th: G3XMM 6,868 points, 53 QSOs. 3rd: G4MEM 11,600 points, 161 QSOs. 1st G1N (op G3MZV) 51,175 points, 399 QSOs. Gordon wins a certificate for leading this section, well done! G0HVQ, 2nd in All Band Low Power section. G4KFT, 3rd in All Band Assisted section. G3YEC, 15th in All Band Assisted section. In total there were 98 entries from England, indeed an indication of the popularity of the contest. “Assisted” means that DX cluster, RBN etc were used, i.e. not true single operator. The 2013 CQWWDX CW takes places on 23rd/24th November. The SSB equivalent takes place on October 26th/27th October.